The 50 United States have various state symbols, including state trees, flowers, songs, drinks, and even fossils. Just over half the states have a state reptile, and none have a state snake (although a few of the state reptiles are snakes). This post was inspired by the witty and spot-on post 'The State Birds: What They SHOULD Be' from thebirdist.com, which struck a chord with me because I've always been underwhelmed by the state birds, many of which are uncreative and absurd. The selection of state reptiles has been characterized by the same lack-of-creativity, bordering on willful ignorance of a state’s unique and endemic biodiversity, as the selection of state birds. In fact, it's probably worse, since most people can at least name several different kinds of birds whereas even distinguishing reptiles from amphibians or fishes (or worms) is apparently beyond many. Perhaps having a state snake would help remedy this problem as well as improve upon the massive and undeserved PR problem faced by snakes in general. At the risk of catalyzing a scandal on par with my home state of North Carolina's State Fruit Fiasco of 2001, which in an effort not to alienate any of several fruit growing lobbies resulted in an official state red berry (the strawberry), state blue berry (wait for it…the blueberry), and state fruit (the scuppernong grape), I've taken the liberty of choosing a state snake for each of the 50 U. S. states, 44 of which I've been to and almost half of which I've caught snakes in. This was surprisingly hard to do, because some snakes have too many good choices and others have too few. I used the same rules as thebirdist: I didn't repeat any species. Feel free to chime in with your opinion about what your state's snake should be, if it differs from my choice. The Eastern Diamondback is iconic in the southeast, appearing on America's first flag, the Gadsden flag (better known as the 'Don't Tread on Me' flag) and in the first political cartoon appearing in an American newspaper (Ben Franklin's 'Join, or Die'). 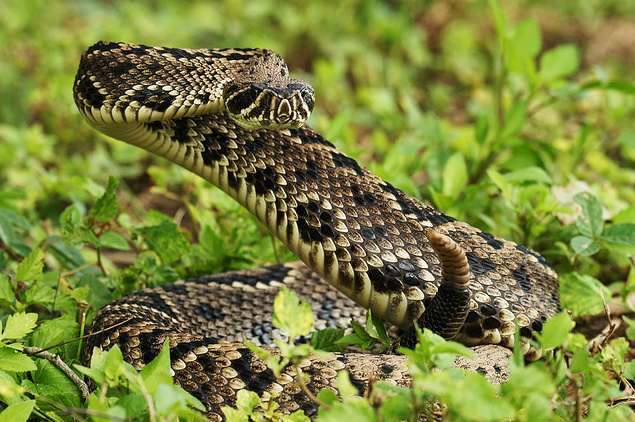 State symbolism of the world's largest rattlesnake might help abate pressure from rattlesnake roundups in Alabama and other states, which have caused declines so serious that this species has been considered for listing under the Endangered Species Act. 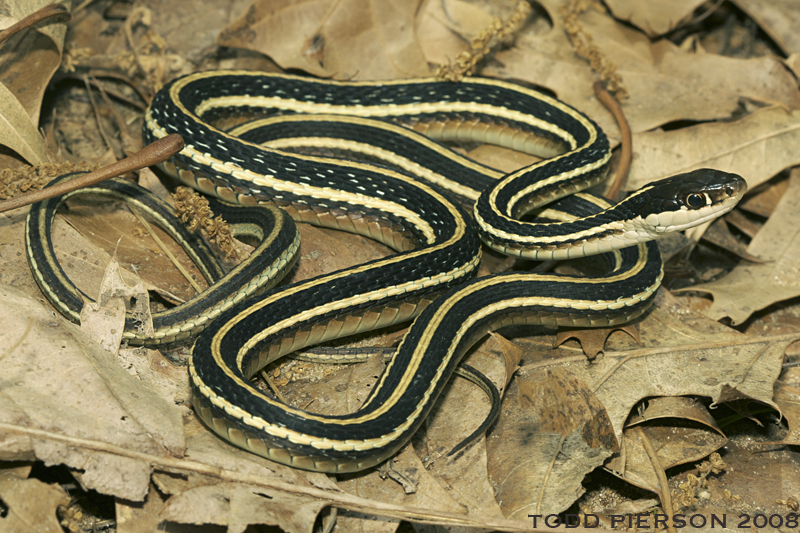 Alaska's only got one snake, and I do mean one: a road-killed juvenile gartersnake was found outside of Haines, Alaska, in August of 2005. The poor condition of the specimen prevented a positive identification based on morphology alone, so some of my colleagues including my fellow USU graduate student Lori Neuman-Lee sequenced genes from the snake and identified it as a T. ordinoides. This highly variable species eats mostly slugs. 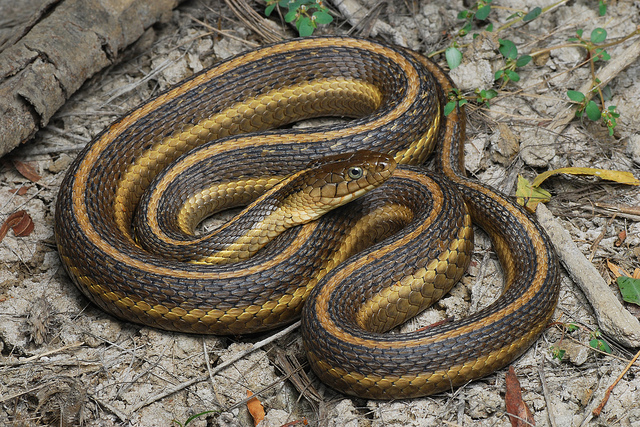 Because the closest known population of Northwestern Gartersnakes is over 600 miles south of Haines, the snake might have been transported there accidentally. However, reports of gartersnakes on the banks of the Taku and Stikine rivers in Alaska, including one ostensibly vouchered (now lost) specimen, keep the door open for future discovery of a naturally occurring population of snakes in The Last Frontier. Don't lose hope, Alaska! If nothing else, gartersnakes from British Columbia will probably disperse there eventually if climate change keeps up the way it's been going. This actually is the state reptile of Arizona! Way to go, Arizona! This snake is a phenomenal choice for its beauty and uniqueness. Principally a Mexican species, it is found in scattered, isolated "Sky Island" mountain ranges separated by uncrossable desert. Former Staten Island Zoo reptile curator and herping godfather Carl Kauffeld, in his classic 1957 memoir Snakes and Snake Hunting, called this species "sublime" and said of finding one that "no greater triumph is possible". It was the last rattlesnake species discovered in the United States, in 1905 (just as the "Baby State," as it was once known, was one of the last states to enter the union, seven years after C. willardi was discovered). These small rattlesnakes grow to be only one to two feet long and as a result are relatively unthreatening. Few bites have been recorded, none serious, although I wouldn't go picking one up. 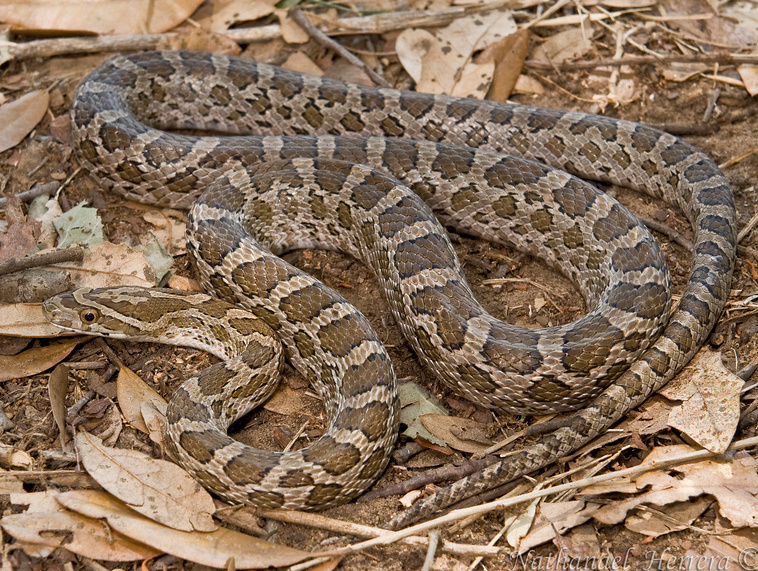 Runner up: Glossy Snake (Arizona elegans), which shares its genus name with the state. When I asked my colleague Geoff Smith, a native Arkansan, about snakes iconic to Arkansas, he first informed me that, as someone born above the Arkansas River, he was an Arkansawyer rather than an Arkansan. He went on to suggest that the Cottonmouth was a good choice because every snake someone sees in Arkansas is identified as a Cottonmouth (a joke that is all too true, poor Nerodia). He also suggested some similarities between Arkansans and Cottonmouths: they stink1, they're fat, they like to eat fish. I decided not to contradict him because 1. I haven't been to Arkansas, and 2. he's from there so he can say that. In the end, we decided that a generalist state needed a generalist snake. 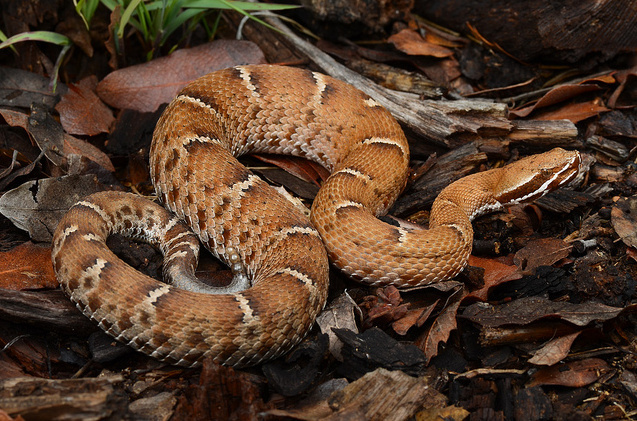 Because Arkansas' diverse landscapes encompass the range edges of many species that are more characteristic of other places (for example, Queensnakes, Coralsnakes, and Western Diamond-backed Rattlesnakes can all be found in the state), choosing a widespread generalist is appropriate. I know of few better examples than the Cottonmouth, a denizen of river swamps that eats a variety of other vertebrates. Furthermore, Cottonmouths might have the worst PR problem of any snake: in addition to being misidentified, they suffer from exaggerated accounts of their aggression, size, breeding habits and even basking behavior ("A Water Moccasin tried to get in my boat!"). State snakehood might help with that. This largest of gartersnakes is endemic to California's Central Valley, where it historically occupied tule marshes but today persists mostly in rice fields and their associated canals and drains, where it mostly eats introduced fishes and Bullfrogs. Because of the massive agricultural use of this area, this species has lostmuch of its habitat and is on the edge of extinction, so it could use some positive PR. It is highly aquatic, with habits more similar to eastern Nerodia watersnakes than to its western congeners - the same could be said of many Golden State residents in terms of their political opinions and attitudes. 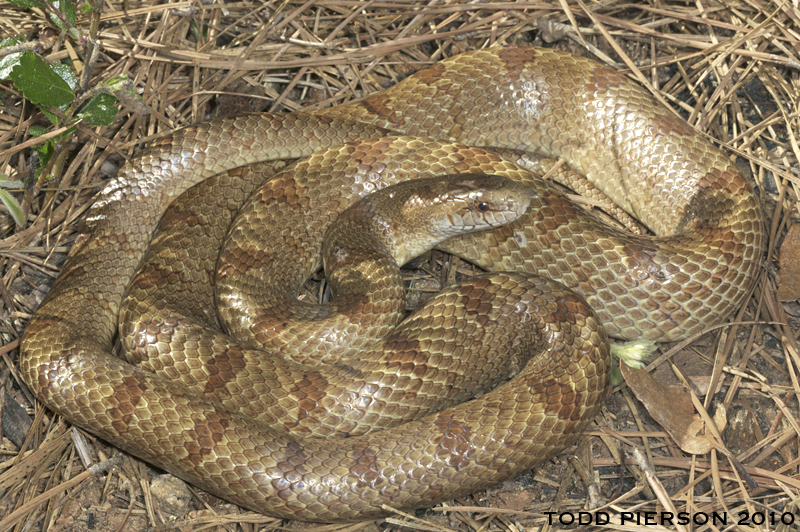 Once considered a western subspecies of the Cornsnake, Great Plains Ratsnakes were re-elevated to full species status in 2002 by College of Staten Island snake taxonomist Frank Burbrink. 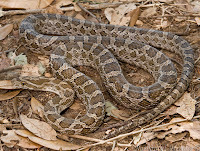 Although Colorado's majestic landscapes are home to many beautiful snakes, not one but two geographically-separated forms of Great Plains Ratsnakes are found in the state: the larger, more brightly colored nominate subspecies in the high plains and tablelands of southeastern Colorado, and the smaller, drabber Intermountain Ratsnake (P. e. intermontanus) on the Colorado Plateau in the west-central part of the state. Originally named by Baird & Girard for surveyor and U.S. Army officer William H. Emory, these large constrictors are more subtly colored than other ratsnakes but just as harmless and beautiful. 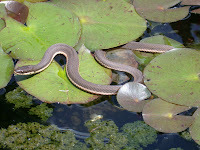 Northern Watersnakes are some of the most common snakes in eastern North America. Found in almost every aquatic habitat, they are frequently seen basking on fallen logs, from which they will drop into the water at the slightest provocation. Leo Finneran reported this species from the Branford area in the 1940s, saying that it was "a very common snake occurring along water bodies in all parts of the town" and noting that some carried heavy loads of parasites, which is common in watersnakes. You can remember how to tell this species from its southern counterpart because the bands across its back fail to connect near the tail. OK, I'm stretching a bit for this one. Keep reading, it gets better. Delaware was the first state, and the Copperhead is the first snake you should learn to identify if you live within its range. Delaware's Brandywine Valley is reminiscent of New England, whereas its middle and lower parts resemble the tidewater South. Both regions are inhabited by Copperheads, which are found from New York to Texas, where they are the most common venomous snakes in many suburban areas. 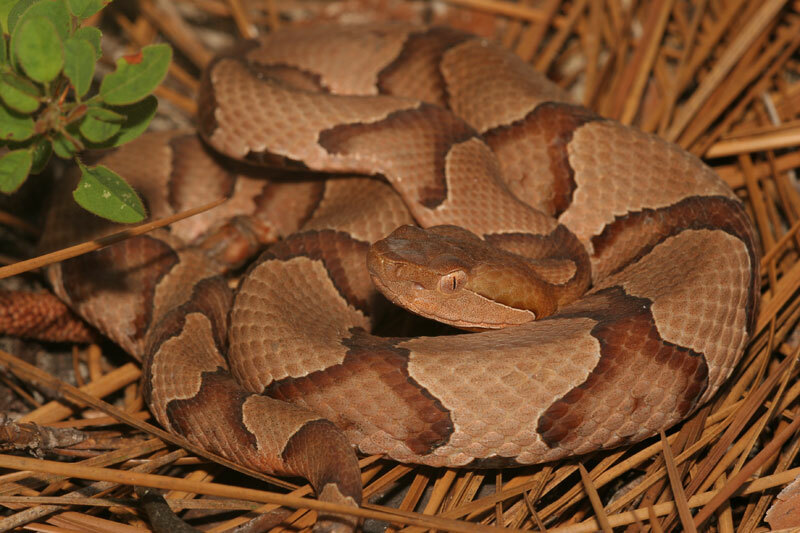 Due to the high encounter rate, more than a third of U. S. venomous snakebites are from Copperheads. Fortunately, they seldom require antivenin, because they have the least potent venom of any North American viper, and the fatality rate is negligible. Furthermore, the vast majority occur when someone deliberately attempts to handle or kill the snake. In this way, Copperheads and their relatives are distinctly "antiwar," eponymous as they are of the vocal antebellum Democrats that once represented Delaware and other Union states in Congress. Florida as a state is unlike any other U. S. state. Coralsnakes are unlike any other North American snakes - they are more closely related to cobras and sea snakes, which live on other continents or in the oceans. They're also brightly colored, like the iconic pink flamingos often seen on Sunshine State lawns. 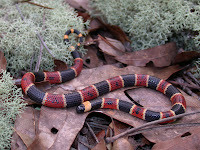 Coralsnakes spend most of their time underground and are difficult to find. When asked how to see one in the wild, most herpers reply: "Go to Florida." Although Coralsnakes are quite venomous, they are secretive and non-aggressive, so very few Coralsnake bites ever occur. Runners up: Short-tailed Snake (Lampropeltis [Stilosoma] extenuatum) or Rim Rock Crowned Snake (Tantilla oolitica), both endemic to the state. The largest snakes in North America and literal "lords of the forest" (from the Greek drymos: forest and archos: commander), Eastern Indigo Snakes are in decline due to habitat loss and fragmentation. Georgia boasts some of the best remaining indigo habitat (both Fort Stewart and Fort Benning harbor large, unfragmented tracts of longleaf pine savanna with healthy populations of Gopher Tortoises, the actual Peach State reptile and the burrows of which these snakes depend upon) and the headquarters of the Orianne Society, a non-profit formed to help conserve indigo snakes and other rare reptiles. This is the Aloha State's only native snake, making it a pretty easy choice. It's also awesome! 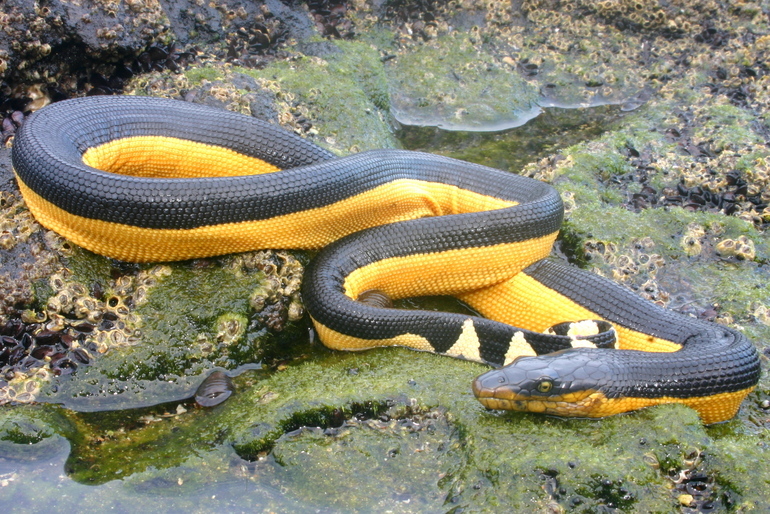 Yellow-bellied Sea Snakes are the only pelagic snakes, and the most widely distributed and specialized of the sea snakes. They are most commonly seen in Hawaiian waters in El Niño years, when average water temperatures are in the upper 70s. Pelamis have fast-acting venom that they use to kill fishes. They shed their skin often to remove barnacles, using a knotting behavior to compensate for the absence of objects to brush against in the open ocean. Paying homage, a Scottish tidal energy company adopted the genus name of this snake for both their company and the offshore wave energy converter itself, although the company closed its doors in 2014. I've written about Rubber Boas before, but man are they cool. Some of the best research on Rubber Boa thermal biology and behavior was conducted in southeastern Idaho, and Craters of the Moon National Monument is a great place to see them. Incredibly, these snakes are active at temperatures as low as 40°F, which is good news for them given that they live in Idaho's mountains. Roughly the same color as a potato, Rubber Boas mostly eat small mammals, which they kill by constriction similar to their larger relatives, which include Anacondas and Boa Constrictors. As is fitting for the Gem State, their small, smooth scales have a rubbery shine. Illinois, like Arkansas, contains many ecoregions but is not dominated by any one that isn't more iconic of elsewhere. There are actually more species of snakes in Illinois than in many southern and eastern states, due to its mixture of northern, southern, eastern, and western ecosystems. I lived here for a while, but it was hard to pick a snake for Illinois because its habitats are so varied. 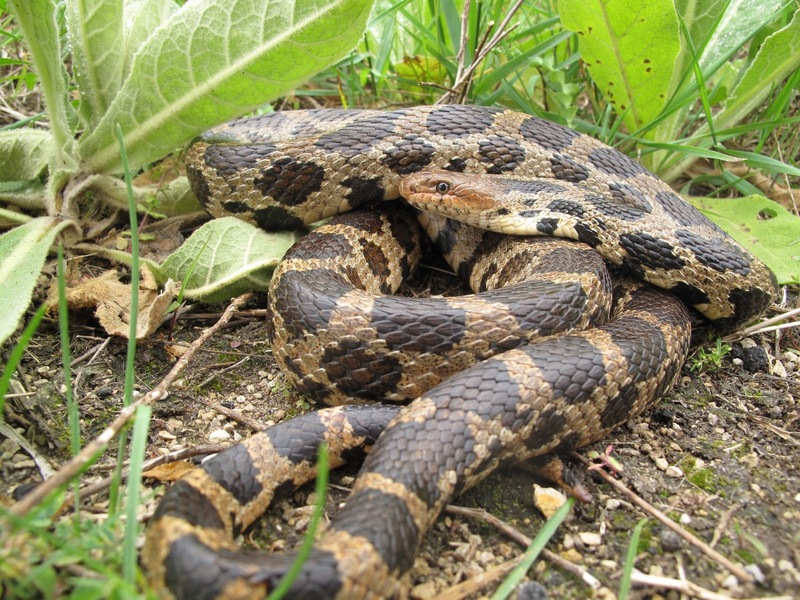 Prairie Kingsnakes are common along Illinois roads and lake shores in spring. Unfortunately, many are run over by vehicles during this time, and still more are mistaken for venomous snakes are maliciously killed. In fact, these large and harmless constrictors are highly beneficial, consuming mice and voles that would otherwise overrun farms, gardens, and homes. In the agricultural desert of the Prairie State, Prairie Kingsnakes are one species that seems to do reasonably well. 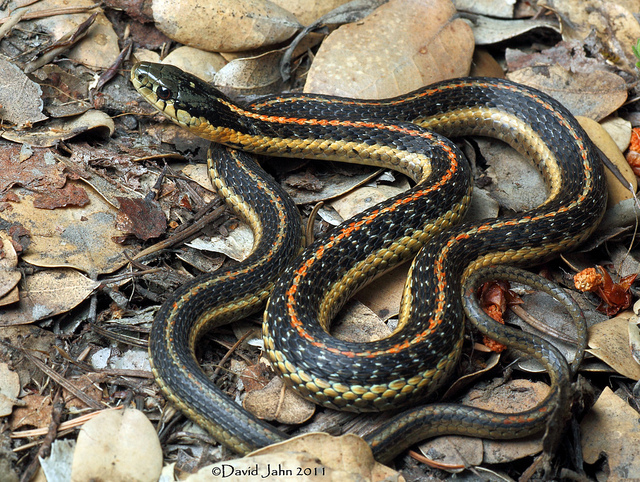 The slender, long-tailed ribbonsnakes share a genus with gartersnakes, from which they are not terribly different. Ribbonsnakes show a preference for wetter habitats and eat predominantly fishes and amphibians. 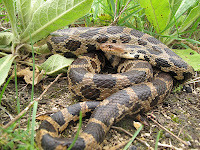 Indiana harbors two subspecies of Eastern Ribbonsnakes, which together are found essentially throughout the state where suitable habitat still exists. Because of the Hoosier State's intensive agricultural land use, a state snake that requires intact wetlands with healthy prey populations could encourage a shift towards sustainable agricultural practices that use minimal pesticide and fertilizer and promote healthy waterways. These large constrictors used to be considered the same species as Eastern Foxsnakes, Pantherophis vulpinus, but were elevated to full species status by Brian Crother and colleagues in 2011. Rapid northward expansion by Foxsnakes from refugia in various southern states following the last glacial maximum has resulted in their odd modern distribution: two species apparently separated not by the gap in the range of the eastern in Michigan but by the Mississippi River. Because they no longer occupy any of the habitat where their fossils are found, it seems that Foxsnakes simply filled in the new habitat made available by the retreat of the glaciers. They had few barriers since the glaciers flattened the topography, and few states beat the Hawkeye State for flat. The Red Milksnakes of Kansas are like jewels. Essentially fancy kingsnakes, these beauties are easy to find underneath large, flat rocks in prairies and fields almost throughout the state. They eat lizards as well as small mammals and other snakes, which should be easy for them to find since they all live under the same rocks. The late herpetologist extraordinaire Henry Fitch undertook detailed natural history studies of nearly every Kansas snake during his long and productive career, publishing hundreds of articles of the highest caliber, and his 1970 paper on milksnake ecology and natural history is no exception. 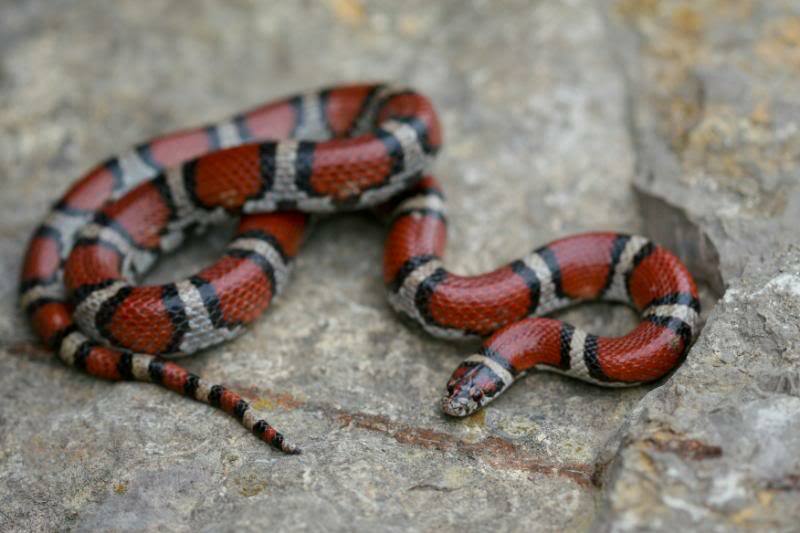 About as popular as a snake can get, the Red Milksnake (L. t. syspila) is an easy choice for the state snake of the Sunflower State. All those states within the range of the Scarlet Kingsnake (L. t. elapsoides) only wish they weren't also home to so many other strong contenders. 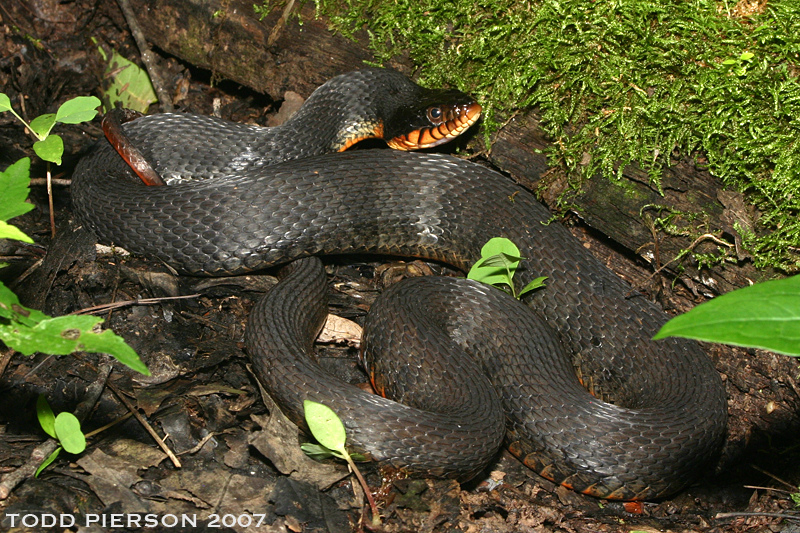 Common elsewhere, a threatened subspecies of Plain-bellied Watersnake, the Copper-bellied (N. e. neglecta), is found in isolated spots in the western part of the Bluegrass State, as well as in adjacent areas in Illinois and Indiana. It is the most terrestrial of the ten species of watersnakes in the US, in part because it prefers frogs and toads to the other, more aquatic prey of its congeners. Uniquely among watersnakes, this species may possess resistance to toad toxin. 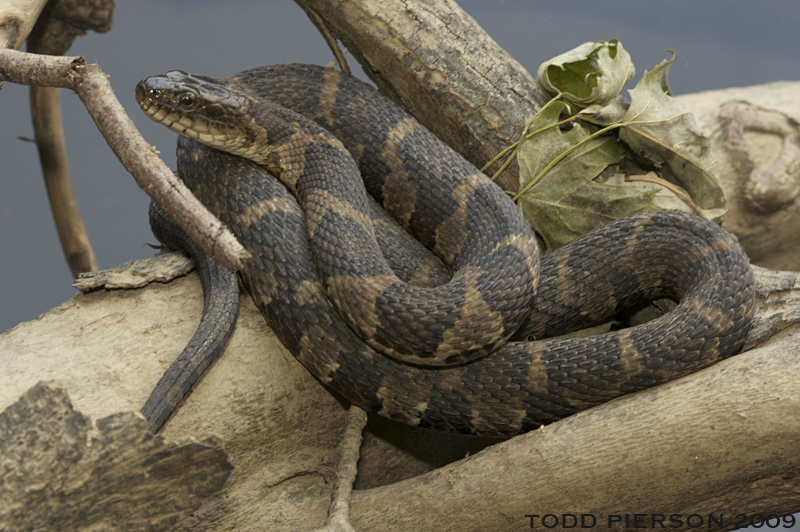 It has been found that, atypically for a watersnake, these snakes tend to choose hibernacula close to wetlands, such as crayfish burrows and muskrat lodges. During spring floods, they are often submerged, but somehow are not drowned or swept away. The presence of these amazing snakes helps justify wetland buffers and adjacent upland conservation as part of the innovative Copperbelly Watersnake Conservation Agreement made between coal mining companies and state environmental groups within the range of the snake, particularly in Kentucky. Notable for its large eggs and small clutch sizes, the Louisiana Pinesnake is indigenous to west-central Louisiana and eastern Texas, where it relies strongly on Baird's pocket gophers for burrows and food. 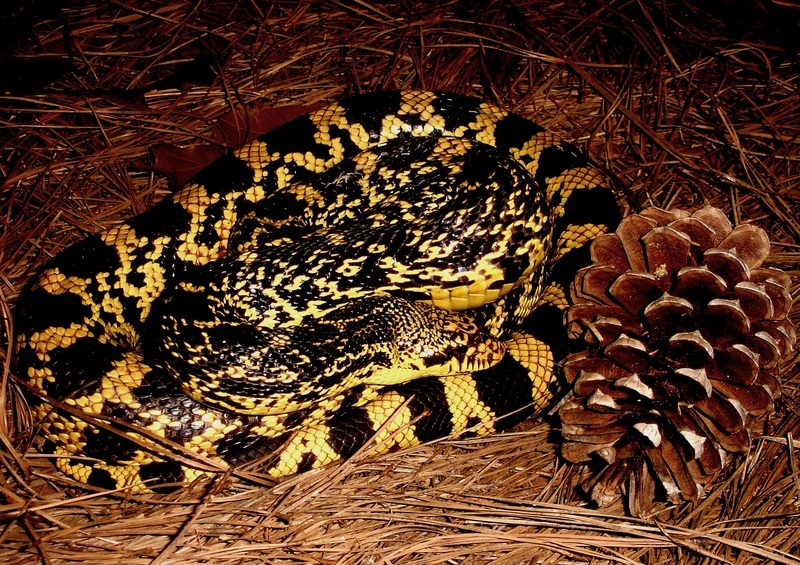 The Louisiana Pinesnake is rarely seen in the wild and is considered to be one of the rarest snakes in North America. The demise of the species is due to its low fecundity coupled with the extensive loss and degradation of suitable habitat, the longleaf pine savannas of the Gulf coastal plain. Now nearly a lost cause, some positive PR could help ensure that the last fragments of longleaf pine are preserved in perpetuity, for Louisiana Pinesnakes as well as their other unique flora and fauna. Although the Pine Tree State has a reputation for being snowy and cold, it is actually replete with snakes, at least in summer along its rocky coast. 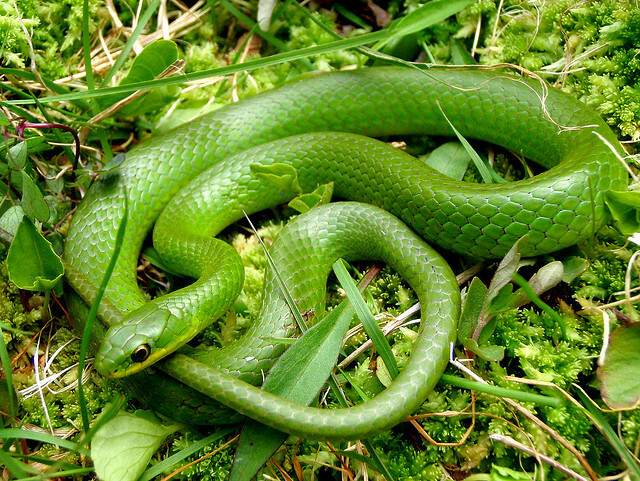 In the crumbling foundations of homes in old fields live many Smooth Greensnakes, a species that is a good example of the ecosystem services that snakes provide because it eats so many insects and spiders. Only a few species of snakes eat insects, this one chief among them. Less arboreal than their rough-scaled congeners, Smooth Greensnakes are quite beautiful and most people seem to know that they are harmless. A ranger in Acadia National Park found them "common" from sea level to above 1000 feet in 1938. 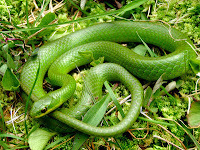 Smooth Greensnakes are even found on Isle au Haut, a remote island in the outer reaches of Maine's Penobscot Bay first settled by Europeans in 1792, so it is likely that this is one of the first North American snakes ever seen by Europeans. Isle au Haut is home to Microneta bowditchiae, an endemic spider, which is undoubtedly eaten by the local O. vernalis. Named for Queen Henrietta Maria of France and crisscrossed by myriad freshwater habitats, including the cool crayfish-filled streams preferred by Queensnakes, Maryland is a beautiful but densely-populated state. From the Central Appalachians in the west to the tidal marshes and barrier islands of the Delmarva peninsula and Chesapeake Bay, Maryland seems to represent the entire gamut of eastern North American habitats. Queensnakes inhabit most of these, although they are absent from the lowest and highest elevations and from brackish water. Research has shown that Queensnakes are exquisitely sensitive to the crayfish molting hormone ecdysone. Because numerous stream contaminants are known to imitate ecdysone and disrupt the arthropod molting cycle, this finding may have important implications for the conservation of Queensnakes and their conegners. These little slug-eaters are named for a Massachusetts herpetologist, David Humphreys Storer, who wrote Report on the fishes, reptiles and birds of Massachusetts in 1839. Being one of the original 13 colonies, Massachusetts should show a little appreciation for its herpetological history. In my experience, these snakes are more common in New England's forests than they are throughout the rest of their range, particularly in Maine, which was once a part of Massachusetts. 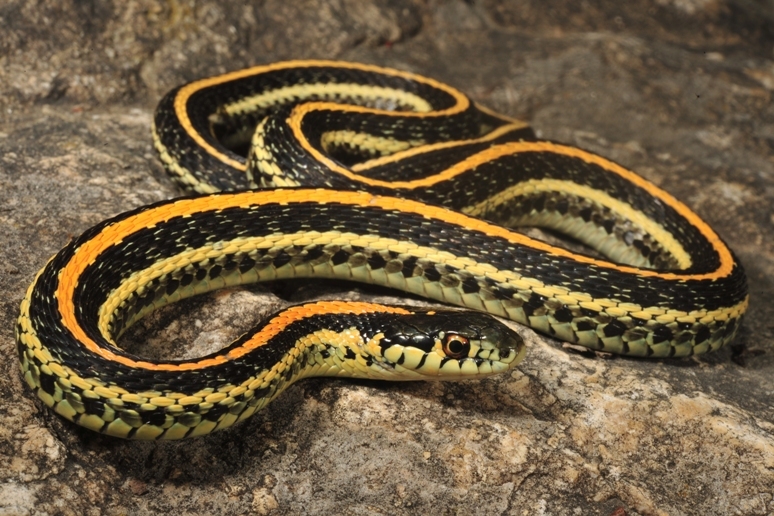 The Bay State gets kudos for actually selecting a group of snakes as their state reptile: the genus Thamnophis, the gartersnakes, is not an inapt choice, although it is a little vague. 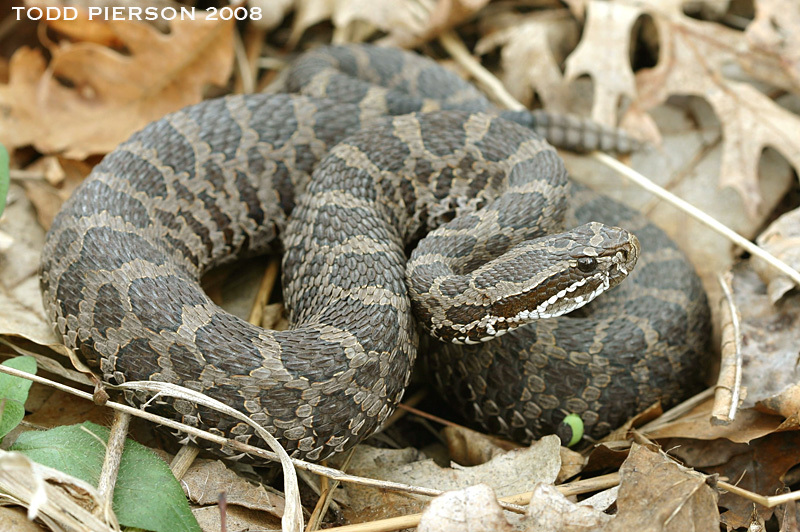 The Eastern Massasauga Rattlesnake has declined dramatically over the last century and is critically endangered in nearly every state where it occurs. Due to human persecution and the nearly complete conversion of native wet prairie habitats to agriculture, this formerly widespread and abundant species is seemingly relegated to just a few viable populations within its historic range in Wisconsin and Illinois. Michigan is its stronghold, and state snakehood might help keep it that way. These beautiful gartersnakes are common in the plains of southern Minnesota. In northwestern part of the Land of 10,000 Lakes, the prairie-forest ecotone is characterized by the westward extension of the forests, which terminate roughly along the Big Stone Moraine, from which scattered areas of relict prairie form "fingers" that extend eastward into the woodland. 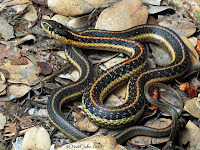 Both Plains and Common (T. sirtalis) Gartersnakes co-occur there, but are not usually found together in high densities, perhaps because the diets of both species consist essentially of the same items: earthworms, minnows, and frogs. Unfortunately, Minnesota's many lakes (the combined shorelines of which exceed those of California, Florida, and Hawaii combined) are too cold, young, and oligotrophic to support any endemic snakes. The Mississippi Mudsnakes has a good ring to it. Found in swamps, which abound in the western part of Mississippi, these gorgeous snakes eat mostly giant aquatic salamanders such as sirens and amphiumas. Seldom seen, their name belies their fabulous coloration, which more than compensates for their clandestine nature. Any state in their range would be proud to honor the Mudsnake with a state snakehood. Mudsnakes prefer still, acidic waters with aquatic vegetation and bottom debris. They also occur along small, acidic streams with swampy edges. Runner up: The Mississippi Green Watersnake (Nerodia cyclopion) shares its name with the state. 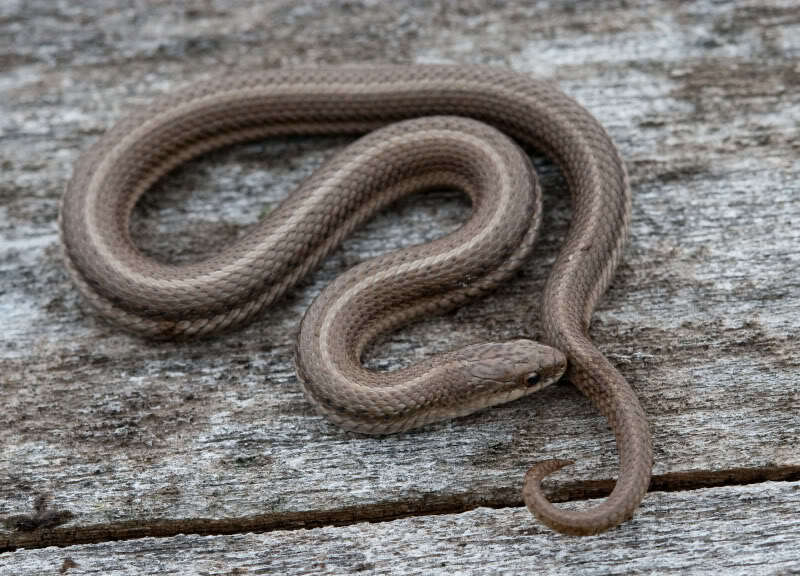 Little is known about the tiny Lined Snake, a small relative of watersnakes and gartersnakes whose scientific name is longer than it is. Little is left of their original habitat, wet prairies, now mostly converted to agriculture. Lined Snakes, often incongruously misheard as "lion snakes," are secretive and semifossorial. The Forest Park neighborhood of St. Louis, south of the zoo and near the wonderful Turtle Park, was built on a hill during the 1920s and harbors a dense population due to the relatively light disturbance to the area's soil, so many urban residents of this city and others in the Show-Me State could show themselves their state snake by turning over paving stones or garden gnomes in their yard or garden. Stay tuned, faithful reader, for Part II! Thanks to photographers Dave Irving, JD Willson, Todd Pierson, James Turek, Lost Springs Ranch, Jason Folt, David Jahn, Jonathan Mays, Atrox, Eric Vanderduys, and Nathanael Herrera.